We will interrupt our series of articles on ‘The Trouble with Innovation’ and begin to weave in between those conversations, a more fundamental argument to help enlighten the debate and understanding around the differences between ‘Monetary Economics’ and ‘Real Economics’. The basic themes of this series of articles will be around growth and shrinking in the economy, value and money measurements. This will be a layman’s guide to understanding the differences and principles of Monetary Economics. We realise that in casual conversations with finance and business professionals, there is a basic misunderstanding of what Monetary Economics is and how it impacts on the broader or ‘Real Economy’. Our quick and ready definition of Monetary Economics is this: Money and currency is only a temporary measure of value. Another definition is: “An economic theory, the proponents of which argue that economic variations, such as changes in prices and output, are primarily the result of changes in the money supply. 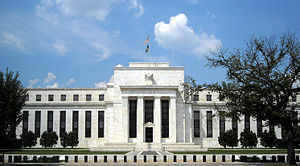 (Thus, the Federal Reserve Board is the most important economic policymaker in the country.) Proponents of monetarism believe that changes in the money supply precede changes in other economic variables, including stock prices, and that a rational policy calls for moderate, steady increases in the money supply.” (See the link monetarism). Now we can get bogged down in definitions and we realise the dangers of always taking the top two or three definitions offered by Google search at face value. An example of a textbook definition of monetarism is: “a range of views which emphasise the role of money in the operation of the economy system”. At this point we need to mention that it is a contrast to Keynesian economics, which is being applied in various degrees in most Western governments at the moment, in order to support the Economic System as a whole. However, Michael Foot, an ex Labour Opposition leader in 1983 made unhelpful comments such as: “monetarism is a worldwide disease” (The Economics of Taxation, Prentice Hall, 7th Edition, we linked to the 9th Edition). Turning to an analysis of the Wikipedia definition we focus on the key phrases of ‘measure of value’, ‘store of value’ and ‘unit of account’. Nowhere in this definition does it mention measurement of output or production, the key building block of the real economy. Therefore, we conclude this first introductory article by making the clear distinction between money as a measurement tool and unit of account and real output or production being the building blocks of economic activity. In the next instalment of this article we will define output, activity and production and then start making the stark contrasts between what monetary and real economics really are. Let’s get the basics of economic language right and move on towards a better appreciation and understanding of the intricacies and interplays of economic discourse and activity.